In chemistry and physics, volatility is the tendency of a substance to vaporize. Volatility is directly related to a substance's vapor pressure. At a given temperature, a substance with higher vapor pressure vaporizes more readily than a substance with a lower vapor pressure. The term is primarily written to be applied to liquids; however, it may be used to describe the process of sublimation which is associated with solid substances, such as dry ice (solid carbon dioxide) and ammonium chloride, which can change directly from the solid state to a vapor without becoming liquid. The vapor pressure of a substance is the pressure at which its gas phase is in equilibrium with its condensed phases (liquid or solid). It is a measure of the tendency of molecules and atoms to escape from a liquid or a solid. A liquid's atmospheric pressure boiling point corresponds to the temperature at which its vapor pressure is equal to the surrounding atmospheric pressure and it is often called the normal boiling point. The higher the vapor pressure of a liquid at a given temperature, the higher the volatility and the lower the normal boiling point of the liquid. 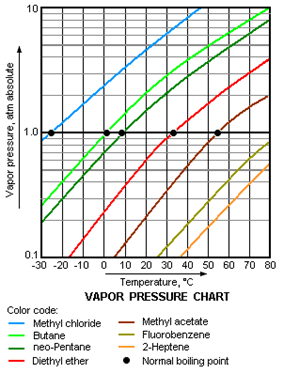 The vapor pressure chart (right hand side) displays the vapor pressures dependency for a variety of liquids as a function of temperature. For example, at any given temperature, methyl chloride has the highest vapor pressure of any of the liquids in the chart. It also has the lowest normal boiling point (−24.2 °C), which is where the vapor pressure curve of methyl chloride (the blue line) intersects the horizontal pressure line of one atmosphere (atm) of absolute vapor pressure. ^ James G. Speight (2006). The Chemistry and Technology of Petroleum (4th Edition ed.). CRC Press. ^ Kister, Henry Z. (1992-02-01). Distillation Design (1st Edition ed.). McGraw-hill. ^ Perry, R.H. and Green, D.W. (Editors); Don W. Green; James O. Maloney (1997). Perry's Chemical Engineers' Handbook (7th Edition ed.). McGraw-Hill.